★720° surround stereo and 98dB high sensitivity make you totally enjoy a immersive,amusing audio - visual world. ★Comfortable memory sponge：comfort-fit on your ears. ★Fit for all smartphones (IOS/Android) between 4.7-6 inch screen size like iPhone 6/6s/7/7 plus/iPhone 8,Samsung Galaxy s5/s6/s7/note 4/note 5, Nexus 6P,Motorola Nexus 6 etc. 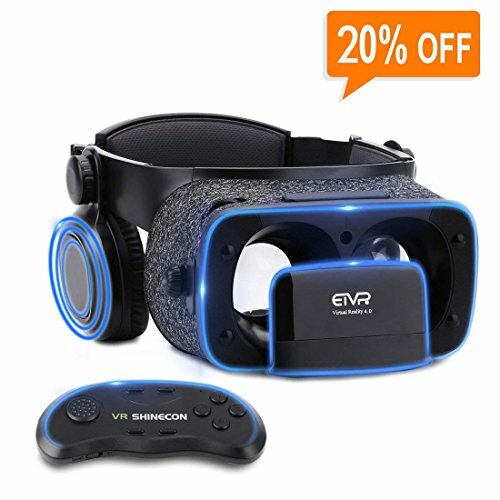 ★Adjustable Lens: 3D virtual reality headset easily adjust the pupil distance(PD) and focal distance(FD),reducing fatigue even if you use it for a long time. ★Suitable for 0-600°myopia and 0 - 200° hyperopia users, satisfied different needs. ★Batteries(2AAA batteries) for remote controller are NOT INCLUDED. ★First use will makes you a little dizzy or double images for some users, please adjust the 2 pupil distance. ★The iPhone 7/7 plus need a 3.5mm convert plug to connect. If you have any questions about this product by geek-2016, contact us by completing and submitting the form below. If you are looking for a specif part number, please include it with your message.